some, or even many, die. Alternatively, beekeepers who open their practically every day are also putting stress on their colonies. New beekeepers can be somewhat excused. They are still learning and are excited to explore their new bee world. The following bee-friendly points work for me. I have called the items, low impact beekeeping procedures. I offer them for thought and review. So much as possible, I have left my fifteen colonies alone all spring, summer and fall. When supering, I looked at a frame or two of brood in the upper brood body, but I tried to keep my intrusion minimal. I did stagger the upper supers to allow for more ventilation. I supered pretty much on time and did a reasonably good job of keeping the grass knocked down. Otherwise, I have not intruded on my bees. Figure 1 Look at this photo from the bees’ standpoint. Are they enjoying this manipulation? I have tried to develop my concerns about requeening. The queen needs to be truly a bad queen before I elect to put the colony through the confusion and disruption of requeening. I suspect that the occasional marginal queen is as good as one that I can quickly get and install. By the time the requeening procedure has finished, the nectar-flow will have essentially passed and I am left with a new queen in a weak colony that has missed the season. Would it be fair to say that a minimally invasive recommendation would be to requeen once per year and, unless disastrous, to live that year with the queen you get? Dead colony from previous winter. Making a split. Probably stressful for the bees. I try to treat for mites in the fall of the year. Some newer materials allow for treating more often. I try to treat correctly and keep my hive openings to a minimum. I realize that mites and bees are developing both good and bad resistance to each other and to chemicals, but for the present, I am assuming that my bees will need some kind of mite treatment at least once per year. So much as possible, I have reduced supplemental carbohydrate feeding for both survival and spring stimulation. I can’t stop it all together and am not suggesting you do, either. At times it is necessary, but I have completely stopped allowing bees to rob extracted supers or honey cans. Robbing is a vicious behavior that results in weaker colonies (sometimes even stronger colonies), if not killed outright, becoming so depleted that they have little hope of surviving the upcoming winter. For colonies that you really care about, prepare for the hive-opening event. Have extra equipment on the truck to replace worn or broken hive parts. In a perfect bee world, you would even have access to a spare queen from nucs that you set up earlier in the spring. 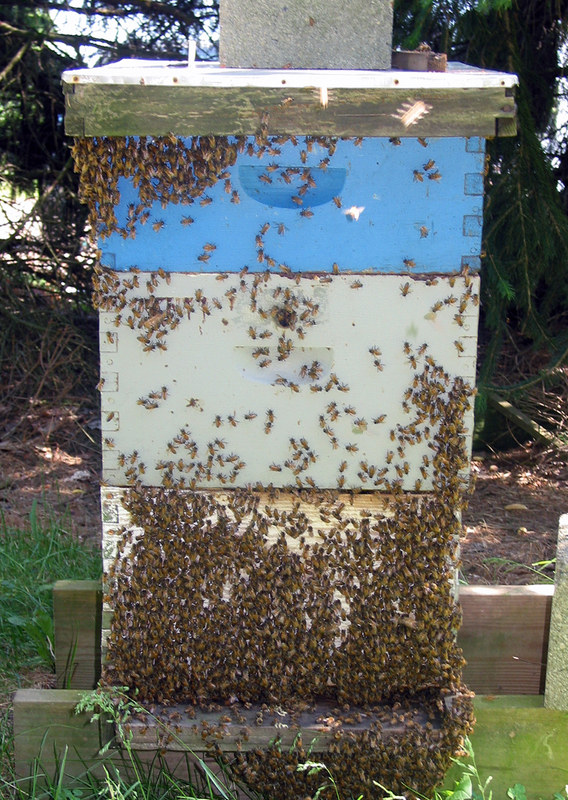 A working number is about one nuc per ten colonies. This past season, I maintained two nucs for fifteen colonies. 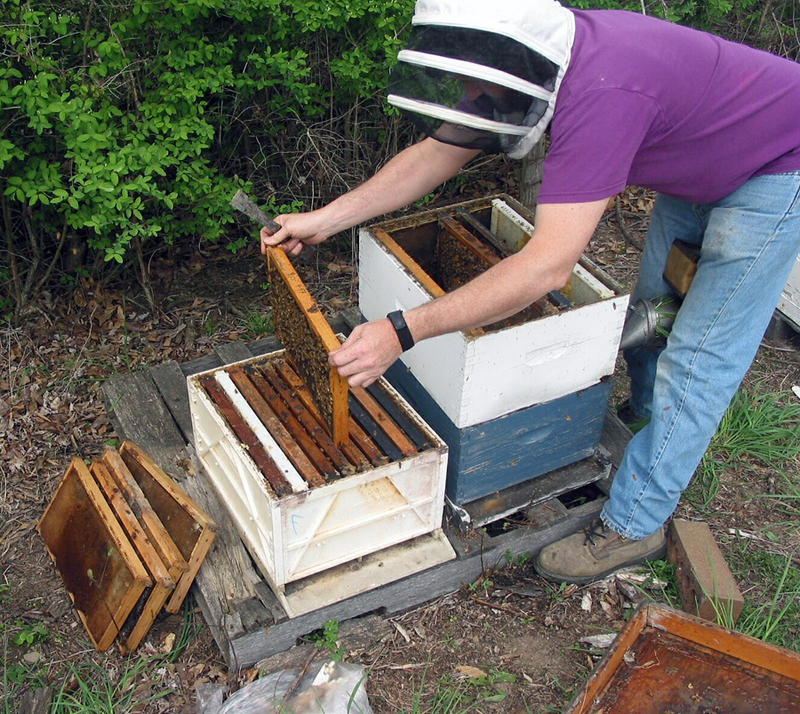 When the hive is open, perform as many chores as possible in order to reduce future trips. On double-sided bottom boards, I use the shallow side (3/8” opening) year round. That way, I avoid having to install and remove entrance reducers. When the season allows, set up an observation hive. Not yet, but maybe soon, I will come around to saying that observation hives are presently undervalued as a management tool. Currently, they are used as educational devices or as novel seasonal hives. They could be so much more. Rather than opening full-sized colonies, I can get an idea of the field events by looking at the observation hive activity. Pollen collection, nectar collection, drone production, and the status of the queen are readily viewable in an observation hive. The performance of a new queen can be evaluated before transferring her to a full sized colony. Brood from the observation hive can be used to subsidize needful field colonies. As it were, both observation hives and nucleus hives provide living spare parts. Plus, upon looking at bees within an observation hive, I satisfy a bit of my beekeeper need to see the inside of a hive. Should the recommendation be one observation hive for every ten colonies rather than a nucleus hive per ten colonies? Maybe sometime I will recommend this, but not just yet. Consider putting on some deeps as supers in order to have spare honey for the winter months when things go particularly bad. Deep supers are heavy – even difficult to handle, but wintering bees can readily use bee-stored honey when nearly nothing else will do. If stored properly, deep supers can be held for several years without undue harm. If stored pollen is minimal, wax moths will not do much damage to stored comb. 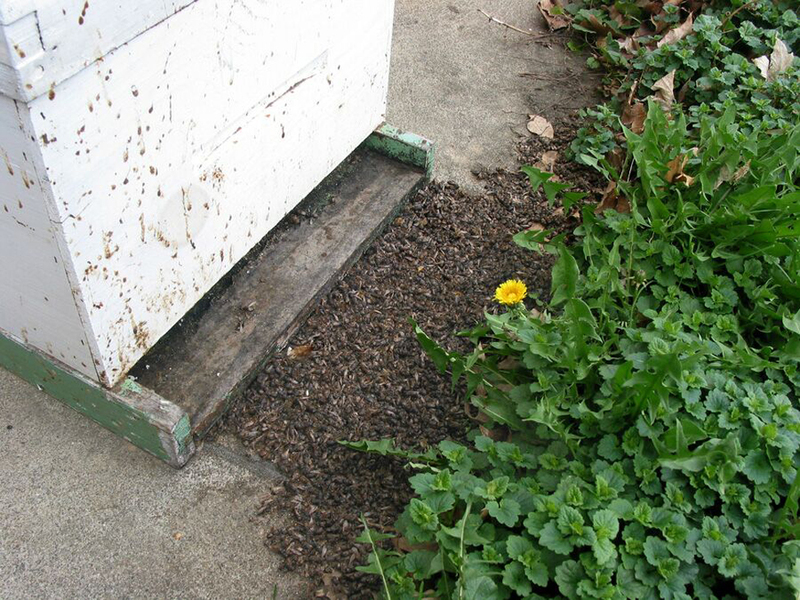 Not only useful as winter-feed, deep supers of honey can be used during spring seasons to make splits or to boost spring colonies needing some help. 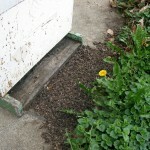 Small hive beetles may attack such stored deep supers. I top super rather than bottom super, but I provide upper entrances. To decrease the distance bees must travel to store nectar, bottom supering stipulates that the empty super goes just above the brood nest and partially full supers are placed above the empty super. It’s considerable work for me and much more disruptive to the bees to remove all supers before adding a new one and frequently, burr comb must be removed or a poor fit results and bees are crushed. Top supering is easier for me and causes less disruption to the colony. Don’t use any more smoke than necessary and only blow cool, white smoke. I’m afraid that too often rather than work our colonies, we bully our colonies. With our protective gear and our smokers blazing, no doubt we are the bees’ most formidable enemy. Use only the smoke you need so the colony can recover as quickly as possible. Though it’s common sense, don’t kill any more bees than necessary to open and close the colony. With their sensitive olfactory systems, the bees know you’ve just killed several hundred of their kin. You think that makes them appreciate your efforts? (A beekeeping secret – the smoke from a smoker is probably not good for your respiratory system. Don’t oversmoke the bees or yourself.) Figure 2 Bees don’t like smoke any more than you. Be considerate. My point: So much as possible, let your bees be bees. I’m afraid that many times we hurt more than we help. We certainly enjoyed the symposium in Clanton. Our best to your mother. Thanks so much for taking time to comment. We are in Dothan with Mom. For the present, she is comfortable. Thanks for your thoughts I am entering my third year as a bee keeper. 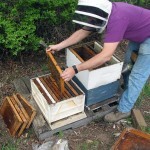 I still have to make myself stay out of the hives.I am still learning every time I open a hive I learn something new. I recently had to be gone for a month in my absence the bees did fine. 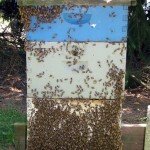 Though I had one hive that was busting at the seams with bees and swarm cells. Here in Ohio it is not the time you want a swarm. I did spilt the hive and both splits has bees and queen cells but I don’t know if I will end up joining them to another hive. But over all I think your on to something. Next year I am going to try and limit my getting into the hives.